For some, alcohol is the indispensable commodity. For others, it is drugs. For a number of us, books prove to be irresistible and foremost among those things in life that we cannot do without. It is fascinating to reflect on why that should be the case for millions of booklovers all over the world. The answers to such musings are many and varied, I suspect. The feelings of attachment can be very strong. When she was ill and dying, Jacqueline Kennedy reportedly asked to have some of her favorite books moved into her room. Presumably, she was not embarking on a final reading binge; she apparently wanted them near so she could spend just a bit more time with old and dear friends before the end came. I can completely understand that impulse, for a true bookworm becomes very attached to books. What is it about books? Where to start? For fiction fans, there is the pure entertainment factor and the escape from life’s hum-drum. The ability of a well-written story to whisk the reader away from today’s here-and-now troubles, even for a little while, is a powerful draw. The literary voyage can transport one anywhere, from the exotic capitals of civilized Europe, to the darkest jungles of Africa – even to the contradiction of Antarctica’s desolate yet serenely beautiful landscape of white. Time is equally capricious; the story can take place hundreds of years in the past, or, just as plausibly,at some time in the far distant future – as in science fiction. And what adventures await the reader/voyager along the way and at the final destination? Anything a creative writer can imagine is possible! Espionage and intrigue, great battles fought long ago, a journey to newly discovered planets – the list is endless. The most effective fiction books, as with screenplays, are those that weave their spell using superb character development and portrayal. Human nature and societal behavior, as vividly displayed in text, is seemingly among the most inexhaustible of captivating themes. The great novelists all had superb skills in that regard; Charles Dickens always comes to mind for me. Fiction allows the reader to live vicariously through the main characters – like Walter Mitty. Readers enjoy tagging along with characters who, perhaps unlike themselves, dare to live life to the fullest while dismissing danger, forsaking the conventional, and ignoring social taboos. There is a large divide between fans of fiction and readers of strictly non-fiction books. Sure, there is often much overlap in interests, but I find that people tend to reside in one camp or the other. Followers of this blog have surely deciphered how I spend most of my reading hours. Although I am aware of missing out on something very good, I do not read much fiction. Why is that? I am in the vexing position of the kid in the candy store when it comes to reading – too many wonderful choices, both fiction and non-fiction. “Too many books, too little time” constitutes the short version of my plight. I have on my shelves, a small selection of excellent fiction; these are books I have obtained mainly because of their universal appeal as great literature and because of the fact that I know I would enjoy them. I really want to read The Great Gatsby, The Adventures of Huckleberry Finn, The Last of the Mohicans, etc. It is the fault of those not-yet read non-fiction books on my shelves that I have not gotten very far into my carefully selected fiction shelf. I will read them in due time, God willing. At first that may seem a trite expression, but I find its declaration to be quite true. I gravitate toward true stories for two reasons: First, because they are true – they really happened to real people; second, because, often, “you just can’t make this stuff up” as the saying goes. Why read fictionalized history when the real thing is every bit as intriguing and the real-life protagonists are just as remarkable as any character imaginable? Well, that’s just my take! The name of this blog is Reason and Reflection: Reason as in science, mathematics, and logical thought – knowledge; Reflection as in a fascination with the human side of life – wisdom. The name reflects my eclectic interests in pretty much everything – from science and mathematics to the nature of the human condition. This concept, this view of books as precious repositories of mankind’s accumulated knowledge and wisdom, is the glue which forms such strong bonds to many booklovers. 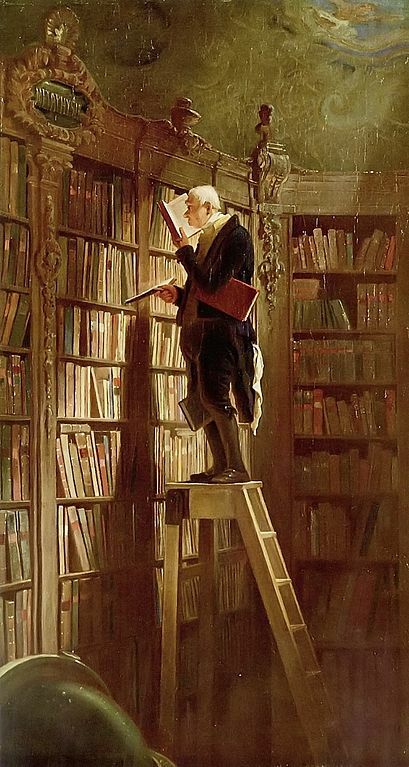 The ideas and discoveries which have changed the nature of human existence have virtually all surfaced, or at least survived, on pages nestled between the covers of books – books which silently preside over the years, the decades, the centuries, on library shelves….somewhere. After 1454 and the emergence of Gutenberg’s printing press, the holy-grail of such printed repositories has been the first editions which initially made the breakthroughs of great thinkers readily available to their fellow man. In rare cases, the “earliest available versions” of books are ancient, one-of-a-kind, hand-written texts which have managed to survive. The printed book is clearly the workhorse of this early “information age,” however. And many of the thoughts and discoveries disseminated in books have fundamentally changed man’s view of himself and his place in the cosmos. 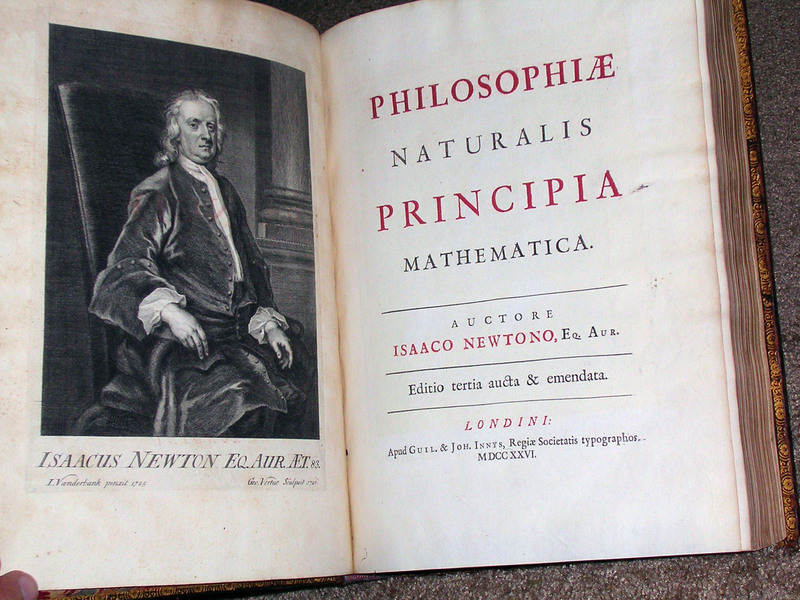 See my earlier post on Isaac Newton’s Principia (in the archives) from October 27, 2013, The Most Important Scientific Book Ever Published: Conceived in a London Coffee House. Several years ago, Stanford University offered a course on “The History of the Book” through its continuing education program. I fortunately heard about it through my younger daughter, another great fan of books and reading. The several-week course convened on campus in the rare book library. Led by one of the university’s rare book librarians, the classes were structured as two hours of lecture and one hour of “show-and-tell.” The lectures were fascinating, and covered all aspects of “the book” from early forms of books and their construction to printing and collation (organization and page-numbering), bindings, and historical importance. Many of history’s greatest books were covered, from science to philosophy. During the lecture phase, the instructor would produce, from his ever-present cart, a book to illustrate his point. The books he chose were often first editions of the most important books that exist. I cannot accurately recall them all, but a typical lot would reflect authors like Pliny, Copernicus, Vesalius, Galileo, Kepler, Hobbs, Newton, Adam Smith, Darwin, Freud, Einstein, Fitzgerald, Hemmingway, and so-on. After each lecture, the books on the cart were wheeled over to join others open for perusal on the long library tables. The class of approximately twenty adults was invited to roam about and personally examine, even “thumb-through,” some of the greatest books ever written – many of them present in their rare, first editions. The instructor was available to answer any and all questions, and there were many. Often, when the class was over and we had filtered out of the rare book library and into the dark, pleasant coolness of the spring evening, my head was spinning as I contemplated what I had seen…and touched. We students had the privilege of holding, in our own two hands, the well-springs which revealed much of humanity’s accumulated knowledge and wisdom – centuries-worth, many in their original, first edition formats. The total value of such books on the rare book market, today, is very high; their true value: Priceless. 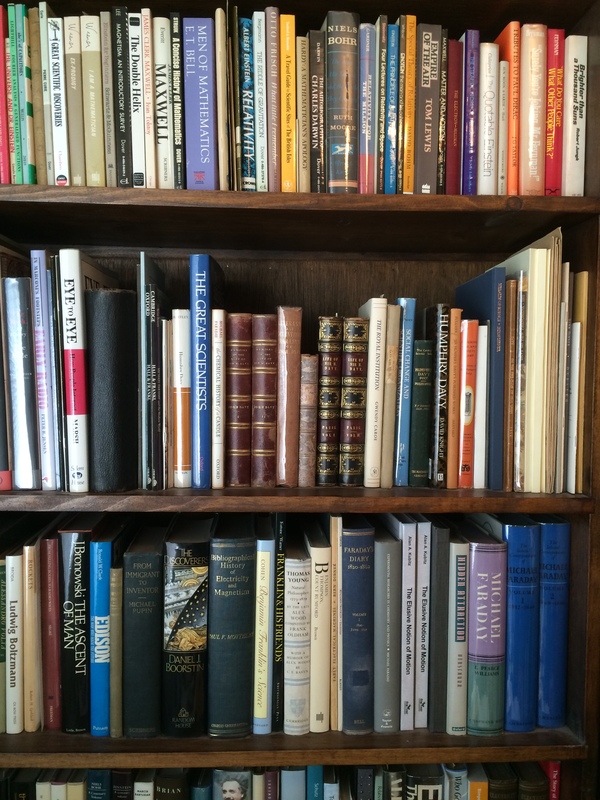 I have, over many years, accumulated a reference library on science and the history of science. These are books that, while very affordable, are valuable resources on scientific milestones and biography. 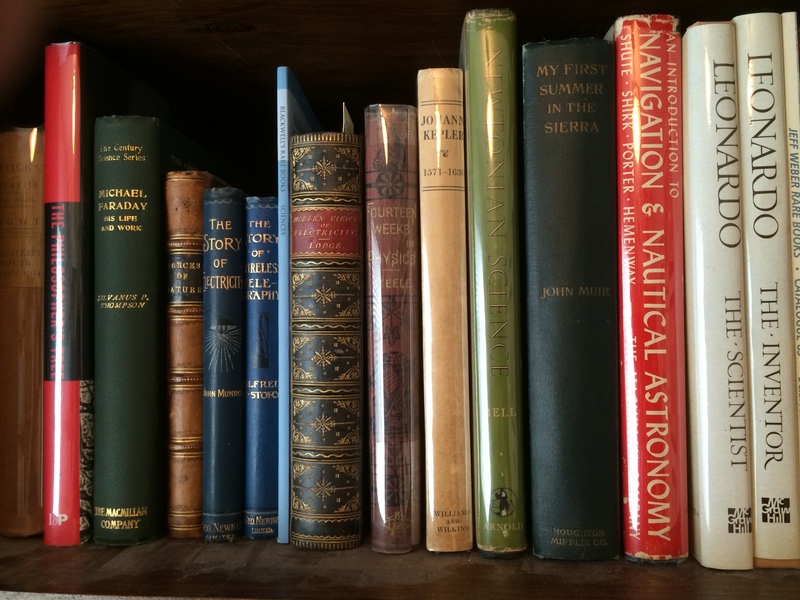 Since I enjoy writing on matters scientific, it is handy to have these books nearby. Above, you can see what happens when there are too many books and not enough bookshelves! 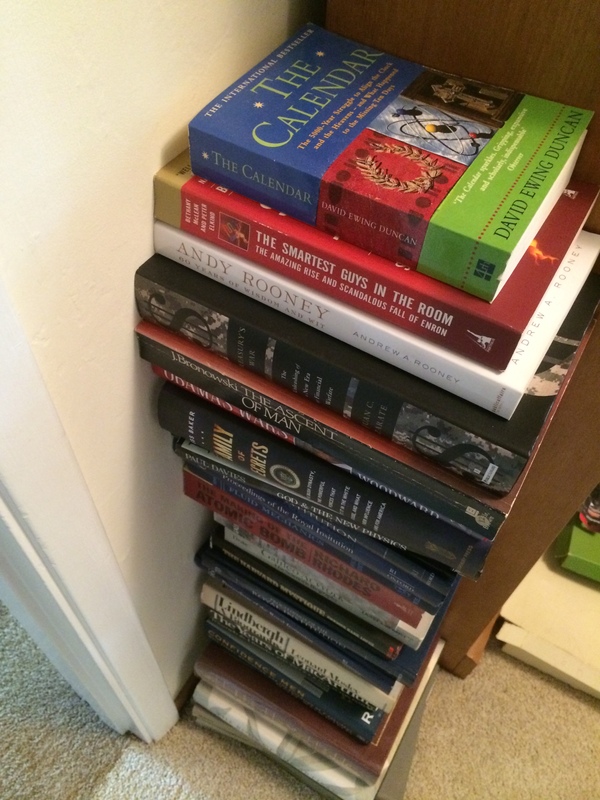 My wife loves books, too, and she has her own collection. 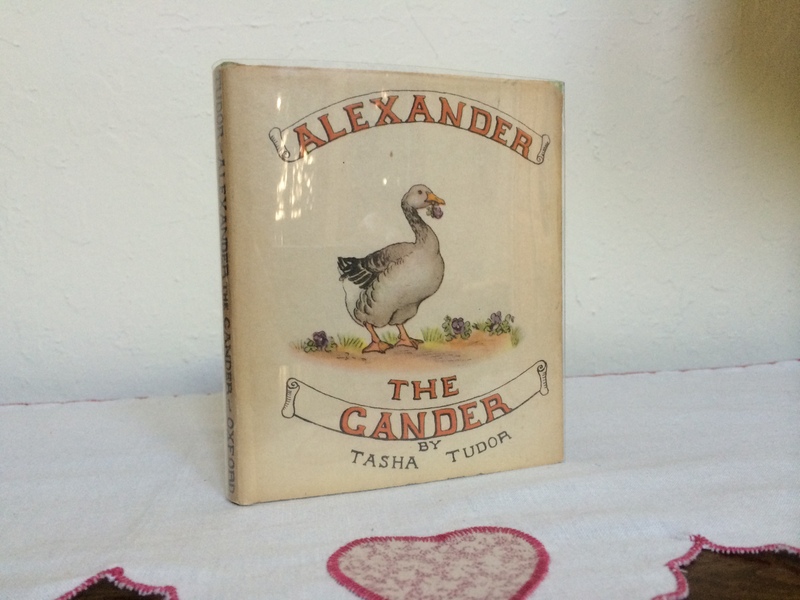 She is a fan of the author/illustrator, Tasha Tudor, and this is one of her favorite items. Long live books! As unlikely as it may seem, the language of science has expressions in common with the language of love. The notion of “physical attraction” has roots in both. We humans are selectively attracted to others during our lifetimes, yet we are constantly attracted, in reality, to everyone and every thing in the universe as revealed by Isaac Newton in his masterwork of science, the Principia. Two marbles, one inch apart on a smooth table, exert an attractive force on one another which would tend to draw them together, except that the force is too small to overcome the rolling friction on the table. Yet, on the larger scale of the sun and planets, the forces of attraction between such massive bodies are immense. “Falling” in love may happen but rarely in our personal lives, yet we are, in fact, constantly falling – even though we are not conscious of the reality. All earth-bound denizens fall constantly… toward the sun as the earth orbits our nearest star. That motion, due to gravity, of continually “falling toward the sun” works in concert with a component of planetary motion tangential to the orbit to define the path of our earth around the sun. 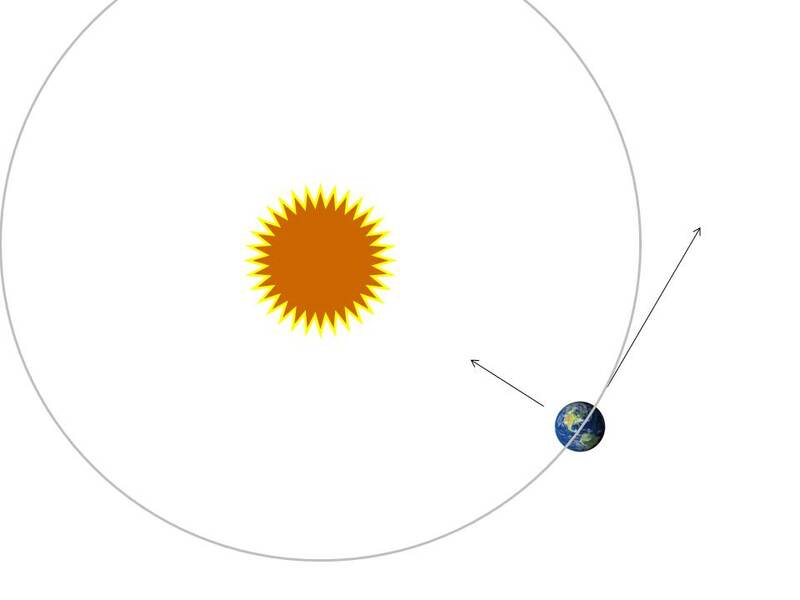 That tangential component of motion represents the inertial path the earth would take if the gravitational attraction to the sun suddenly ceased. The concept of “gravity” has historically been one of mankind’s greatest comprehension challenges – one of nature’s great mysteries. Early man’s curiosity as to why things apparently fall toward the center of the earth was at least temporarily assuaged (for hundreds of years) by Aristotle’s assertion some two thousand years ago that the earth’s center was the “natural center of the universe,” hence the logical place for objects to congregate (prior to Copernicus in 1543, the sun and planets were assumed to revolve around the earth). The great mathematician/scientist, Johannes Kepler, in the early seventeenth century was an early disciple of Copernicus’s sun-centered solar system and one of the first to seriously contemplate what kind of natural, physical mechanism was at play to keep the planets moving around the sun as they do. He conjectured that perhaps some form of solar, “magnetic” winds or vortices swept the planets along in their almost-circular paths. It was generally believed, prior to Newton, that whatever phenomena, or “force,” that caused apples to fall to earth was distinct and different from the celestial forces that held the heavens together. For a long time, celestial motions beyond the moon were even attributed to divine influence and motivation. It took the genius of Isaac Newton to declare, in his 1687 milestone book on science and mathematics, that earthly gravity and heavenly forces are one and the same – hence, universal. Indeed, Newton claimed that all objects of mass in the universe attract all other objects to greater or lesser degrees via the force of universal gravitation. He stated that the nature of gravity and the equation which describes how it works is applicable everywhere and at all times – a truly “universal” law of nature! Although Newton explained the scientific version of “physical attraction,” he wisely made no attempt to explain the underpinnings of the version expressed in the language of love. Nor will we! That remains as captivating and mysterious as ever and seemingly beyond the ability of science and mathematics to explain. But Newton really did not explain what gravity is or why it acts the way it does; he admitted so in the 1713 second edition of the Principia stating: “Non fingo hypotheses,” which, translated from Latin declares, “I feign no hypotheses!” He was criticized by his peers for his advocacy of this mysterious force-at-a-distance; they asked, “How can a body like the sun transmit, through empty space, the tremendous forces necessary to steer the planets?” His contemporary critics should have called to mind that other mysterious force which travels through space – magnetism, in the form of the magnetic field – which also has the power to attract objects. Newton was sage enough and courageous enough to stick by his contentions even though he could not explain them all. Although his famous equation does not hint at why gravity works the way it does, it describes precisely how it works – well enough to be used by NASA for its precise orbital computer computations. Despite the tremendous success of his theory of gravity and his numerical analysis of it, Newton did not – could not at that time – grasp the true essence of gravity. This is a remarkable situation which aptly reflects the reality that science will continue to inexorably peel-back, layer by layer, the deepest mysteries of our existence. Sometimes, genius like Newton’s transcends the state-of-the-art and “the possible”…for a while. It took Albert Einstein’s 1916 general theory of relativity to go Newton “one better” and unmask the true face of gravity. Planets including the earth go around the sun in almost-perfect circles (ellipses) and not off into distant space not due to an explicit force of attraction between themselves and the sun as Newton proposed; Einstein showed that they are merely following a “natural path” determined by the curvature of four-dimensional space-time around the sun. That curvature is caused by the presence of the sun’s mass. All bodies of mass curve space-time in their vicinity. Einstein advanced physics immeasurably by contributing this radically unique physical interpretation of all gravitational effects. The complexity of Einstein’s mathematics in the general theory of relativity required to demonstrate this conclusively dwarfs Newton’s simple equation for an attractive force as presented in the first illustration of this post. Nonetheless, Newton’s achievement regarding gravity remains one of the greatest milestones in the history of science. Despite the phenomenal track record science has compiled while continually advancing the state of our knowledge and well-being, the greatest of all mysteries may prove to be beyond the comprehension of science: Who is the ultimate maker of universes and what can we truly know about that? In last week’s post of October 20, 2013 titled Starbucks and the Long Tradition of Coffee Shops, we reflected on the creative dynamics that are often nurtured in the relaxed, contemplative environment of these establishments. We cited the genesis of the Harry Potter empire and the birth of Isaac Newton’s scientific masterwork, the Principia as examples. 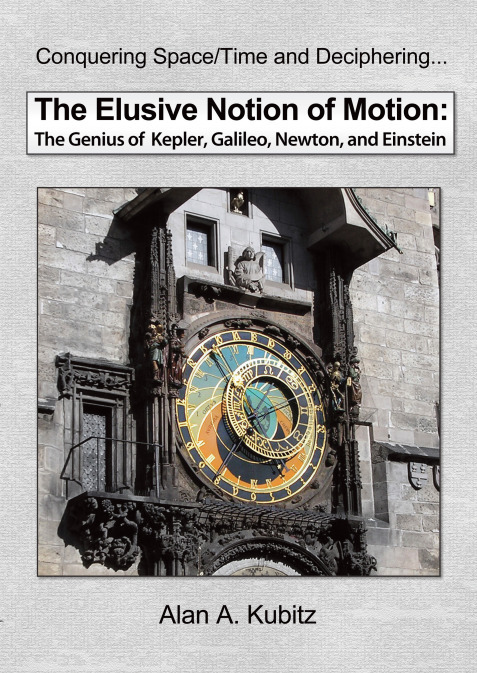 In contemplating how to best present the fascinating story of Newton’s great book in this follow-up post, I decided to press a somewhat lesser work into service (tongue-in-cheek) – namely, my own book, The Elusive Notion of Motion: The Genius of Kepler, Galileo, Newton, and Einstein which relates the principles and the historical development of motion physics in terms the layperson can understand. 1. The planetary orbits around the sun are elliptical. 2. A planet sweeps out equal areas (over the ellipse) in equal times as it travels around the sun via a line drawn from the sun to the planet. A natural result of this fact is that a planet travels fastest when it is closest to the sun. 3. The mathematical squares of the times of revolution of planets around the sun is proportional to the mathematical cubes of their mean, or average, distances from the sun. Kepler’s three laws of planetary motion were not so well known in 1684, but it seems plausible that at least his first law specifying the ellipse for planetary orbits was recognized by the trio of Royal Society members. The fact that they were postulating an inverse-square force for such orbiting planets implies an educated guess based, perhaps, partly on Christian Huygens’ recently published result quantifying centrifugal force for a mass moving circularly about a center. At that time, there were no accepted theories as to what held the planets in orbit or how any such force mechanism acted as a function of separation distance. The three laws of Kepler were most certainly known to the young, virtually unknown mathematician-philosopher at Cambridge University, Isaac Newton. The challenge among the three friends was to prove that the ellipse was the correct path for bodies, subject to a supposed inverse-square force of attraction, something that Kepler was never in a position to do; his first law was determined using Tycho Brahe’s superb observational data and Kepler’s own meticulous curve-fitting calculations. Robert Hooke promptly claimed that he could demonstrate the argument for an ellipse as the resulting orbit, but he fell far short of the mark when pressed by Wren and Halley to produce his proof. Halley then suggested that they contact the young man out at Cambridge University who had developed a local reputation for clever thinking and a command of mathematics. Hooke had crossed paths with Newton years earlier over the subject of optics and light. Their correspondence on those matters had been hostile, prompting Newton to generally avoid Hooke when possible during the intervening years. Halley took it upon himself to travel out to Cambridge in August of 1684 to meet with Newton. When asked the question concerning the expected orbit of a planet subject to a force proportional to the inverse square of the distance, Newton casually replied that it would be an ellipse. When Halley asked how he knew that, Newton stated that he had calculated it, whereupon the excited Halley pressed to see his proof. Newton shuffled his papers in a halfhearted attempt to find his derivation but sent the disappointed Halley home empty-handed with a promise to renew the proof and send it to him. In November of 1684, Halley received by messenger a small, nine-page treatise called De Motu Corporum In Gyrum (On the Motion of Bodies in Orbit). When Halley perused the paper, he was dumbfounded, recognizing at once that not only had Newton provided the desired mathematical proof, but in so doing he clearly demonstrated elements of a new science of dynamics which, in their generality, would revolutionize science, astronomy, and mathematics. This treatise, De Motu, was, of course, the kernel of what would soon become the Principia, the greatest scientific book ever published. Halley hurried back to Cambridge and, with all his considerable influence and powers of persuasion, convinced Newton to deliver a manuscript copy to the Royal Society in London as soon as possible. At this point, Newton dropped other activities which then heavily centered on alchemy and, finally seized by the importance of the new endeavor, devoted himself completely to it. Expanding his treatise De Motu, Newton soon was working on a manuscript to be published in book form by the Royal Society. Newton worked feverishly on the book for over two years, fashioning a manuscript that would revolutionize both science and man’s potential for future discovery. The resulting manuscript was an incredible compilation of pioneering concepts and mathematical physics which no one else could have likely assembled in a lifetime, let alone two years. When the time came to publish Newton’s book, the Royal Society had run out of funds due to recent large outlays for a book on fishes which had flopped and drained the organization’s coffers. Halley, being a man of science himself and realizing the great importance of Newton’s manuscript, took responsibility for the arrangements and the cost of publishing by personally guaranteeing funds. Halley was not at all financially flush at this time, so his personal gamble was great; seldom in recorded history has there been a better bet. Other than writing the book itself, Halley shouldered the burden of the entire enterprise, which included dousing a heated imbroglio between Newton and Robert Hooke. This crisis flared when Hooke again surfaced in Newton’s life just prior to publication, soliciting credit for a suggestion on celestial mechanics made in a letter he had sent to Newton back in 1679. That 1679 letter had been composed during a period of reconciliation by Hooke after earlier disputes with Newton over Newton’s publication on the nature of light in 1672. In this new letter, Hooke asked Newton to communicate any objections to his proposal that the motion of the planets could be visualized as the compound result of a tangential motion and an attractive force directed toward a central (to the orbit) body. What Hooke was proposing here, he had published in his Attempt to Prove the Motion of the Earth, published in 1674. This theory he was asking Newton to critique was no less than the key to the orbital dynamics of heavenly bodies. He proposed that the motion of a planet around the sun—indeed, the motion of any orbiting body—is comprised (compounded) of both a tangential (to the path of the orbit), straight-line motion and a motion toward the central body which is produced by an attractive force between the two bodies. The inherent tendency to move in a straight line along a tangent to the orbit is, or course, due to the property of inertia as ultimately stated in Newton’s first law of motion. The fact that the orbiting body does not take a tangential path out into space but continually “falls” toward the central body is due to the force of gravitational attraction between the two masses, which curves the motion inward. Although Newton had not yet formulated his theory of universal gravitation, he and others such as Hooke were prepared to acknowledge that there could well be an attractive force between heavenly bodies which supported orbital paths. The point here is that Hooke cannot be credited with postulating universal gravitation prior to Newton because Hooke was not really cognizant of a universal force—governed by one consistent equation—for all bodies of mass at all locations in space. Rather, he more likely visualized any attractions between bodies of mass as peculiar to the particular system under consideration. Although he missed the potential of universal gravitation, Hooke had instead likely been the first to describe and publish the key concept underlying orbital dynamics—his compounded orbital motion theory. Indeed, the argument can be made that, prior to Hooke’s communication, Newton had a fuzzy view of the situation. Newton tended to think of an inward force of gravitational attraction balancing an outward force or tendency which he and others termed centrifugal force. The accepted view of modern physics provides no credence for the concept of centrifugal force. Newton’s response to Hooke’s theory was ambivalent, initially. With his letter, Hooke undoubtedly jarred into action the Cambridge professor’s vast intellectual powers. Once Newton realized at some later point—undoubtedly rather quickly—that Hooke had possibly trumped him and nailed a crucial point defining orbital dynamics, it must have been a bitter pill. In retrospect, it took no less a mind than Newton’s to synthesize the patchwork of known physics into a comprehensive system of the world in the Principia of 1687. Certainly, Hooke, nor anyone else, could have even come close. 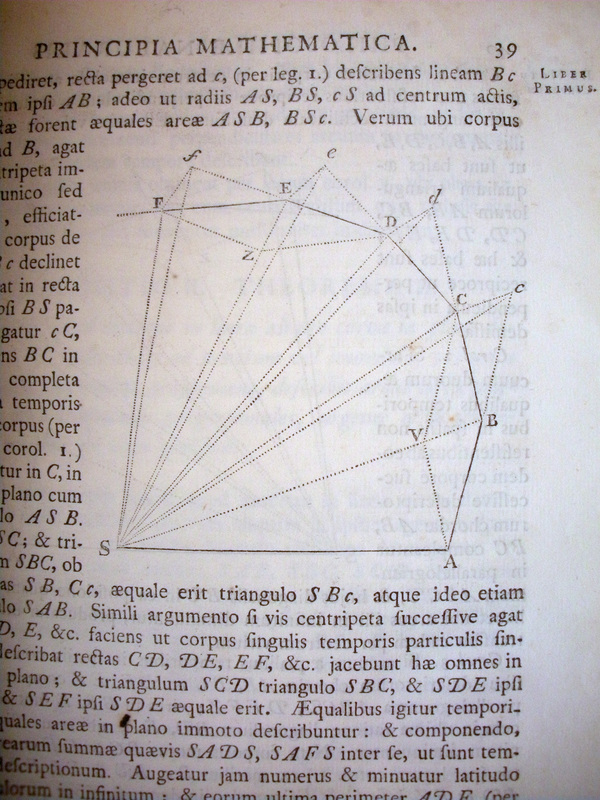 One cannot fault Hooke for wanting mention in the Principia for, in his mind, contributing a key piece of the puzzle. Curiously, however, he apparently viewed as his claim to fame not his theory of compounded motions but rather the inverse-square (of distance) law for the sun’s attractive force on the planets. The latter concept had been mentioned also in his letter to Newton in 1679 and had been essentially an educated guess on Hooke’s part. Newton had mathematically deciphered the inverse-square force relationship years earlier than Hooke’s letter and was in no mood to give him credit for Hooke’s guesswork on that score. 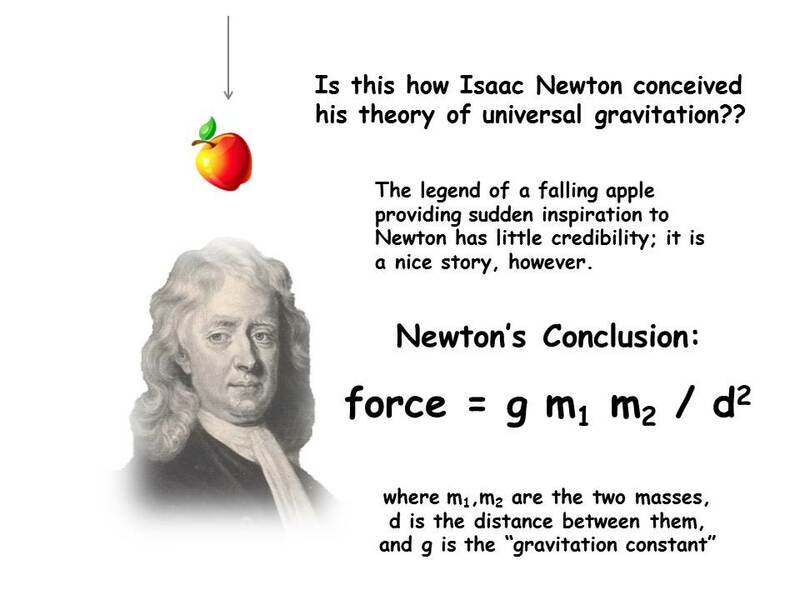 Newton’s fury at Hooke for claiming any form of credit might well be attributed to their generally tempestuous relations over the years, but the fact that Hooke trumped him on the key concept of compounded orbital motion could not have sat well with an ego like Newton’s. It is not likely that Newton would have been receptive to Hooke even if Hooke had more properly claimed credit for his compounded motion theory of orbits instead of the inverse-square law. Lashing out at Hooke through Halley, Newton threatened to withhold the final part, or third book, of the manuscript, which prompted the harried Halley to exercise all of his considerable tact and diplomacy with Newton. Newton railed at Hooke and his interference, with Halley as intermediary, while claiming that natural philosophy (science) is such a “litigious lady” that one should beware of becoming mired in her clutches. Referring to such priority battles, he claimed to have experienced her (science’s) hostile nature formerly and now each time he “approaches” her. No mention of original contributions by Hooke appears in the Principia. While Newton did not steal from Hooke, he displayed no finesse in the situation, preferring to lash out at the slightest offense, real or imagined. Much was at stake for Halley personally as well as for science in general, and he finally prevailed as first copies of the completed book left the publisher in July of 1687. History owes a great debt to Halley for enabling the Principia. Over many years, Halley and Newton remained on very good terms, always respectful of each other. This fact pays generous tribute to Halley’s competence, character, and diplomatic personality, for very few people whose paths crossed Newton’s were able to maintain an amicable relationship with him over any extended period of time. 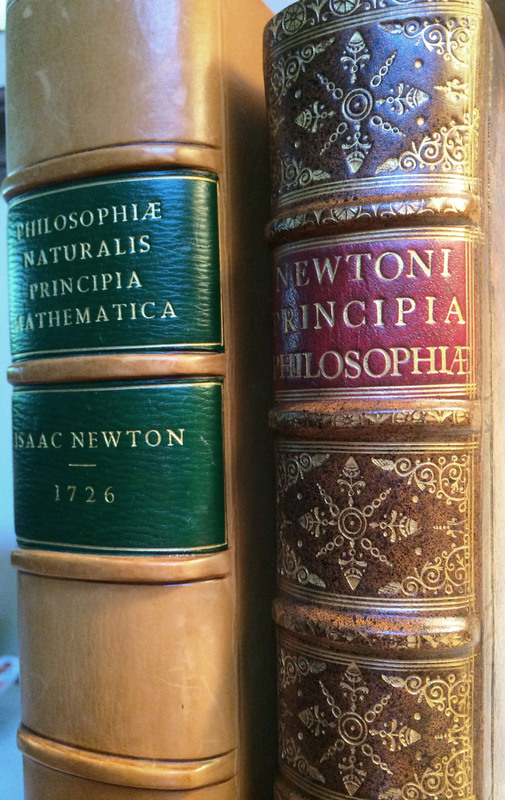 For those whose curiosity is tweaked re: Newton’s masterpiece, the Principia, I encourage you to explore the many books (in addition to mine) which relate, in layperson’s language, the essence and importance of his achievement. His book, more than any other, provided a giant leap forward for science and mathematics. Its impact changed and still influences the way we live our lives – lives heavily determined by the technological advances Newton’s genius enabled…and it all began in the coffee houses of London.